th in this difficult process. In Separating Aspects, Armand Diaz guides us through break-ups, divorce, and other partings from an astrological perspective. 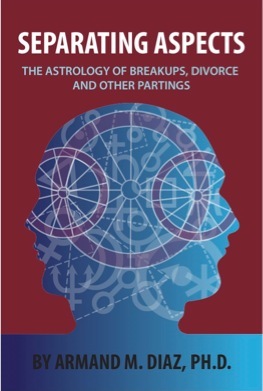 The key to understanding break-ups is in the styles of change associated with the four outer planets, but this book goes further. Describing astrological signatures for relationship styles and the importance of all of the planets and points in the chart, Separating Aspects makes a great reference for both practicing astrologers and students of astrology who want to go deeper their understanding of relationship dynamics. Separating Aspects is not a dour book, but one that is full of hope and promise. We are in the process of rewriting our scripts about partnership, creating new and innovative approaches to relating. Working with our expectations and assumptions about this area of life can open up new possibilities and free us from the constraints of the past. Within every break-up is the potential for growth, evolution, greater compassion, and better relationships. "When you come across a book that enthralls you at every page while also teaches you something new, you’ve got a treasure. In Separating Aspects, Armand Diaz has accomplished this remarkable feat. His writing is infectious as he expertly conveys the astrology behind relationship endings. You’ll find yourself talking to the pages, exclaiming “Yes! That’s me!” Armand writes in a style every reader will relate to while managing to weave in nuggets of astrological wisdom and practical advice you’ll find invaluable. A must read!" "With many of our clients seeking solace and understanding following a breakup this compassionate and beautifully written book provides invaluable reading for all astrologers. I highly recommend it and will be adding it to my students reading list." "Break-ups are frequently peak phases in which a client consults their astrologer. Armand Diaz’s latest literary creation is a guide for astrologers in assisting their clients through the pivotal times of separation in this post Saturnian, Uranus-square Pluto era. Armand Diaz presents the complex, multi-faceted astrological landscape of relationships, with clarity and integral perspectives, helping clients to be conscious navigators on their journey rather than passive passengers bound by their fate. A must have for every astrologer’s transpersonal toolbox." "Separating Aspects is not a how-to astrology book, but a discussion about relationships framed within the astrological context. Armand Diaz writes from years of experience, both as an astrologer and a person. He weaves in wit, wisdom and practical sense as he humanizes the difficult issue of relationship partings--how we might understand them astrologically, and how we find broader meaning by working through them. 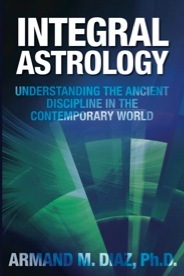 A masterful, work, it is a valuable resource for both the astrological novice and professional." "Separating Aspects is a compassionate and instructive guide to modern relationship patterns, especially during the difficult transition of divorce or separation. It is bound to become a classic and deserves a prominent place on any astrologer's bookshelf"
"Separating Aspects definitely adds to the existing body of literature on relationship astrology. If you’re a consulting astrologer, you can’t go wrong with this one. Just buy it!" Or Click Here to Purchase on Amazon! Now Available in Kindle Edition!! A new paradigm is emerging in Western civilization, led by transpersonal psychology, chaos and complexity theories, general evolution theory, and the human potential movement. Leading developmental researchers are extending psychology upwards, linking it with mystical states to embrace spirituality. Coordinating fields of information both new and old, integral theorists are creating a truly holistic approach to the many ways of knowing that are part of the human experience. Astrology should have its place among these disciplines: through the Dark Age when materialism reigned in Western culture astrology held aloft a light, reminding us that we do not live in a meaningless, mechanistic universe but within a meaningful, conscious cosmos. Yet for astrology to be fully recognized, astrologers need to have understanding about their field: where it has been, where it is, and where we might take it. In Integral Astrology, Armand M. Diaz, Ph.D., offers an exciting new way for astrologers to approach their ancient and diverse discipline. He emphasizes that there is not one astrology, but a number of astrologies, each of which expresses a particular place on the cultural landscape, an inner or outer orientation, and a stage of consciousness evolution. He shows how these diverse perspectives create a dynamic mosaic of astrological knowledge, and presents a model for a truly inclusive, integral astrology that honors both its traditions and innovations while also building bridges to other disciplines and ways of thinking. Astrologers and students will not only expand their own awareness of astrology, but will also improve their ability to communicate about astrology with clients, other astrologers, professionals in other fields, and even the occasional skeptic. Integral Astrology will also help each astrologer to recognize their own strengths and limitations - an important step in becoming a better professional. "Armand Diaz's effort to develop a way to define astrology's place in the modern world get the idea of a paradigm exactly right, but in the end does he develop that new model successfully? I will the leave that to the reader to judge, but as he says in the Epilogue 'The ultimate purpose of a multidimensional model is not to create a more elaborate system of pigeonholes, but to loosen the boundaries of our limitations, to learn to dance among a variety of perspectives.' And that is exactly what Integral Astrology does. Read it - it will make you think." - Kenneth Irving, Ph.D., from his review in Horoscope Guide. Order Integral Astrology today for only $19.95, tax and shipping included within the United States, and to Canada, or 24.95 to the UK, Ireland, and Australia! (Other countries email me for information). Be sure to include your shipping address when you order! You should receive the book within a week of your order! Check out an abbreviated Table of Contents and a short excerpt from the Preface.